Milton Speed Skating offers 4 week Introduction to Speed Skating lesson throughout the season. Why not learn to go fast AND have fun! Contact registration[at]miltonspeedskating.com for more information. 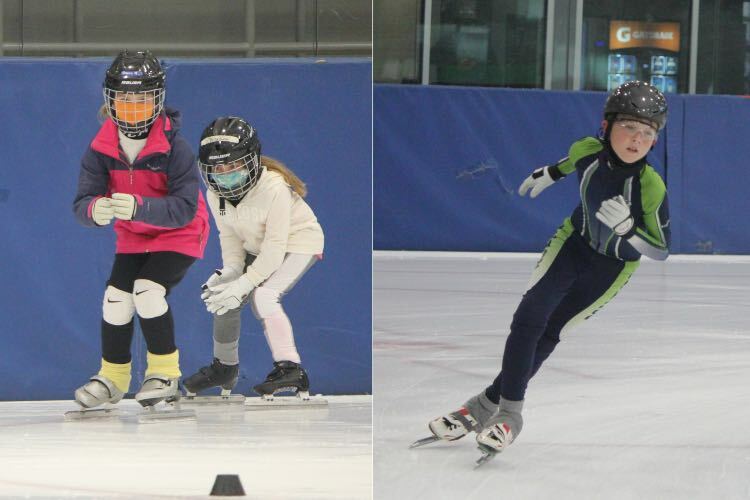 The introduction to Speed Skating program is run in four week sessions throughout the skating season. The objective of the program is for participants to try the sport and see if they would like to continue as a regular member. This program is open to all skaters 5 years and older who have basic skating skills. The skater should be able to navigate one (100m) counter-clockwise lap of the ice under their own power in a reasonable amount of time (about 35 seconds). Or have completed Pre-CanSkate level 6 or CanSkate level 1 which is offered by many skating clubs including the Milton Skating Club. Depending on the makeup of each intro group, the coach will gauge the level of the skaters and pick the activities accordingly. When the program is completed, the Introduction to Speed Skating participants will be assigned to a regular practice group and offered a pro-rated fee for the remainder of the skating season. knee protection (volley ball knee pads). shin protection (soccer style shin guards). Note: Bicycle helmets are not permitted. We do have a limited amount of loaner equipment for Introduction to Speed Skating participants. The 4 week session costs $100 and includes skate rentals.